SUPPLIER BLACKLIST is designed to be a user-generated international blacklist of unsafe suppliers. 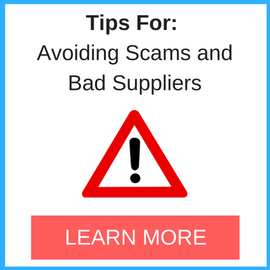 All information on this site is written and published by users/buyers who had a bad experience with a supplier. The content of this site is purely informative and designed to help other buyers to avoid pitfalls. The administrators of supplierblacklist.com are part-time volunteers from the international buying community and it is impossible for them to review all content. Content posted by users to this website expresses the views and opinions of that user and does not reflect the views of supplerblacklist.com management and owners. By joining this forum, user agrees to only post content that they believe is true and accurate. User agrees not to post any messages that are obscene, vulgar, sexually-oriented, hateful, threatening, or otherwise in violation of any laws. Users are legally responsible for what they write in this forum and if their posted content is not accurate, lawsuits can be filed by suppliers against them for defamation/libel/slander. 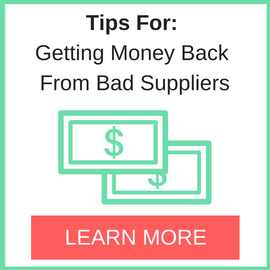 SupplierBlacklist.com encourages users to post accurate, fact-based content when listing what they consider to be a bad supplier on our website. By agreeing to forum rules, the user attests that the content posted is valid and is giving SupplierBlacklist.com irrevocable rights to post it on this web site. The user acknowledges that once the content is posted, it cannot easily be removed, even at the request of the user. The publishers of supplierblacklist.com assume no responsibility for editorial or clerical errors or any errors occasioned by honest mistake. All information contained on this website is subject to change by the appropriate officials of supplierblacklist.com. Supplierblacklist.com (owners, management, volunteers, employees, advertisers and partners etc.) assumes no responsibility for the relevance, accuracy, completeness or quality of the information provided on this website. Liability claims against supplierblacklist.com which refer to any kind of damage of a material or immaterial nature caused by the information provided on this site, or the use of incorrect and incomplete information, are explicitly excluded. Supplierblacklist.com is not responsible for the content of any non- Supplierblacklist.com web pages which, are referenced by or reference the SupplierBlacklist.com website. The Supplierblacklist.com is not responsible for any defamatory, offensive, misleading, or illegal conduct of other users, links, or third parties. The risk of injury from the foregoing rests entirely with the user. Links from the Supplierblacklist.com website to non- Supplierblacklist.com sites, or from other sites to the Supplierblacklist.com pages, do not constitute an endorsement by the Supplierblacklist.com. The links are for convenience only. It is the responsibility of the user to evaluate the content and usefulness of information obtained from other sites. www.SupplierBlacklist.com has no formal staff and we simply do not have the manpower to monitor the website or judge the accuracy of a request to delete or change a listing. And if we are contacted by someone claiming to be an involved party requesting a change, we have no way to verify this. When the original listing was made, all users have agreed to follow the forum rules which include notice that listings can’t be removed at a later date, even at the original author requests, for the reasons above. We welcome relevant parties to state on the listing (in the comments section) how the situation has changed. And if the buyer made a mistake in the listing, wishes to change their position and/or no longer considers the supplier a bad supplier, please provide as much information as possible in the comments section (under the original listing) regarding how the situation has changed. Note 1 : While the listing can’t be removed, at least you have clarified the situation by making public your current position. If you are still in contact with the supplier that you now no longer consider a bad supplier, let them know that posting your update and sharing your experience will let the public know that the supplier is a good supplier that worked with you to correct the situation. That will help restore their online reputation. Note 2: SBL receives a lot of communications from blacklisted suppliers pretending to be the original author of the post. As such the email address of the author of the above clarification will need to match exactly with the email address of the author of the original posting in order for the new comments to be approved. Get in touch with the buyer, resolve your conflict and post an update to Supplier Blacklist. Ask the buyer to post and update as well. If a conflict cannot be resolved or if you believe information posted by the buyer is not accurate, feel free to post your side of the story in the comments section of the listing. Provide as much information as possible and stick to the facts. Remember that authors of content are legally responsible for what they write in this forum and if their posted content is not accurate, lawsuits can be filed by the offended party against them for defamation/libel/slander. SupplierBlacklist.com encourages all users (buyers, sellers and related parties) to post accurate, fact-based content. If information posted on a website is defamatory, but the author is unwilling to retract their statements and/or the website is unable to remove the information, please contact the search engines directly to remove specific website URLs from search engines results. Most likely you will need to obtain a court order to remove specific website URLs from search engines results. First sue the author of the information and obtain a court order declaring the content on the website defamatory and/or illegal. The court order can then be presented to a search engine, like Google, which voluntarily removes websites containing defamatory content from its search results upon being presented with a valid court order. Although the content remains on www.SupplierBlacklist.com where it was originally posted, once it is removed from search engine results it is essentially gone for most practical purposes. The original listing will not be viewed unless someone goes to the original listing or happens to search www.SupplierBlacklist.com where the content is hosted. A website, or Internet Service Provider (ISP) cannot be sued for defamation related to a third-party comment or post. Why? Because back in 1996, the Federal Government passed Section 230 of the Communications Decency Act, which provides a safe harbor from defamation liability, over user comments, to ISPs, hosting companies and website operators. For example, Facebook is not held responsible for defamatory comments posted by any and all users. The user may be held responsible, but not the website.